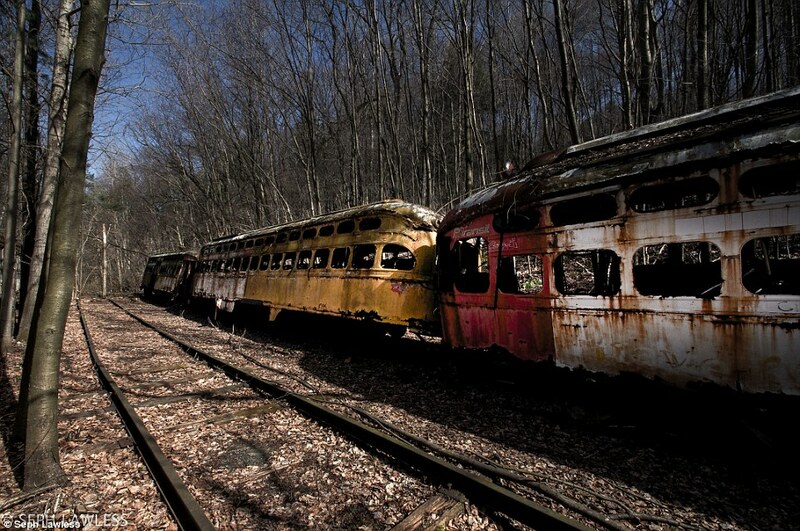 It’s all over the news: an urban explorer/photographer stumbles across the rotting skeletons of numerous trolley and train cars “in the Ohio woods near the Ohio/PA border”: The remains of the Trolley Tragedy of 1957. While in the area, a local lets it be known that the site is also believed to be haunted. A man who lives in the area told Lawless the train wreck is referred to as ‘The Trolley Tragedy of 1957’ and it’s believed to be haunted. FOX8 out of Cleveland also published an article on July 9th that stated “Lawless said his new book, ‘The Trolley Tragedy of 1957,’ is based on folklore in the area.” But FOX43’s article from the same day call the location an “abandoned train wreck”, not once, but twice, including in the headline. So what exactly is the Trolley Tragedy of 1957? Well, do any sort of online search for “trolley tragedy of 1957” and guess what you get? Nothing but links to recent articles about Lawless. There is not a single piece of documentation to support that anything happened at the site Lawless photographed. You would think that even if this event was “based on folklore in the area”, there’d be something about it on the Internet, especially given the speed at which ghost stories and urban legends spread across the Web. But there’s nothing. OK, but where did all the trolley cars come from? Well for one, the cars aren’t located in the “Ohio woods”. They are actually over the border in Pennsylvania (and no, I’m not telling you where they are–you’ll be trespassing if you go there, so don’t). Regardless, it would appear that most, if not all of the cars at this site are owned by the Vintage Electric Streetcar Company out of Windber, Pennsylvania. By the sound of things, the company is “storing” the cars with the intent of selling them, possibly for parts. Here is a link to a page which lists the cars at this location. Purchased by the Vintage Electric Streetcar Company in 1992 (unknown when they were moved to their current location). 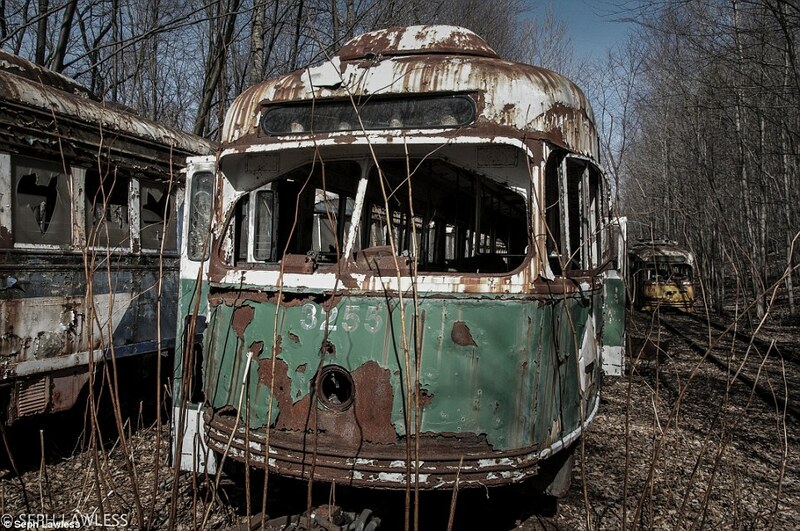 So you see, not only were these trolley cars in operation almost 30 years after they were supposedly involved in some sort of “tragedy”, they never left the state of Massachusetts until 1992 when they were taken out of service–35 years after they were alleged to have been involved in a “tragedy” in Ohio…even though they’re actually in Pennsylvania. It’s pretty easy to check all this information, too. In the Daily Mail article, car numbers are clearly visible in 3 of Lawless’ photographs. The car numbers are 2290, 3259, and 3255. Do a search for any (or all) of those numbers on the “inventory” page for the Vintage Electric Streetcar Company and it will pull up the information on those particular cars. Look, I’m not trying to stomp on someone for trying to make a name for themselves or get their work out into the mainstream. Lawless’ photographs are indeed stunning and some are downright creepy. What I’m taking issue with is the clear disregard to historical facts and the attempt to attach imaginary disasters to a location. And why wasn’t any of this fact-checked before being sent out across the news wire? In my opinion, the photographs stand on their own as a testament to urban decay, albeit in a rural setting, which makes them even more intriguing. Fabricating stories associated with the photographs only cheapens things. Could these cars be haunted? Sure, I guess so. But one thing is for certain: the ghosts aren’t the result of the Trolley Tragedy of 1957, because that event never happened. You can read the entire NewsNet5 article here. The Daily Mail article can be read by clicking here. The FOX8 Cleveland article is here. YOu can read FOX43’s article by clicking here. The Zap2it article can be found here. The Weather Channel article is right here. 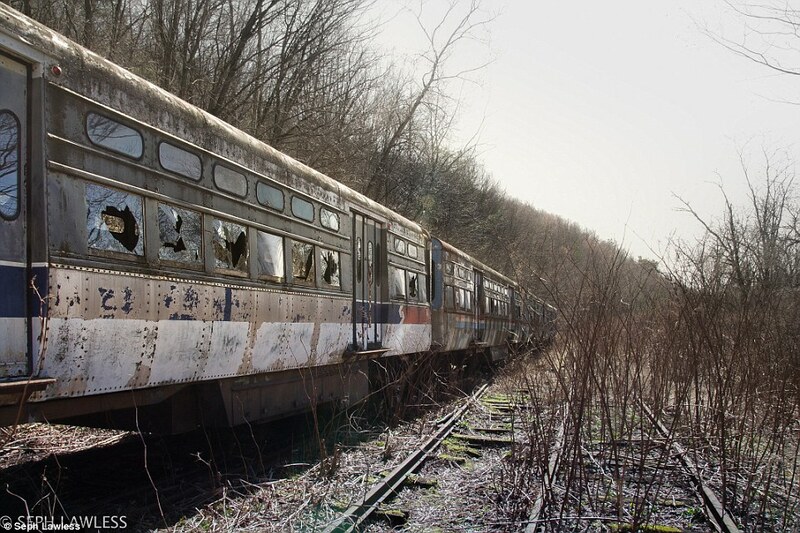 The web site DCist has an article entitled Pennsylvania’s Streetcar Graveyard that gives more background on the site and where the cars originated from. Understandable! Thanks I appreciate the reply. Have any other cool Northeast Ohio locations on your blog? Love hearing about new discoveries! the trolleys should had been in either a trolley museums or septa or any transit company should had been running them.